Graphic design is the crucial element of contemporary marketing. You cannot launch a good website or create compelling content if you don’t follow graphic design trends and keep up with competitors. But it’s not an easy thing to do. Recent advances in technology have reshaped the business landscape. As an entrepreneur, you need to embrace the digital world to be able to compete in this new era. Establishing a strong online presence has become a primary step towards growth. It’s not just about being visible online. It’s about communicating effectively with your target audience. It is only by doing so that they can understand your brand and understand why they should care about it at all. 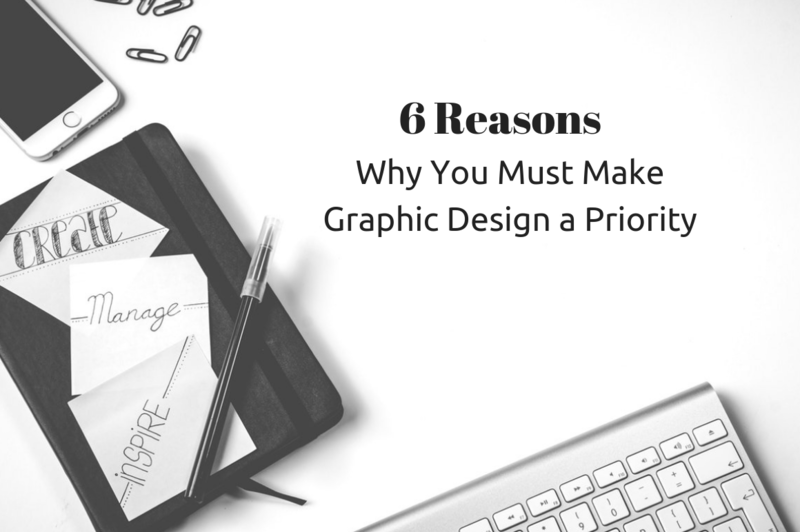 And there’s no better way to do all that than through graphic design. 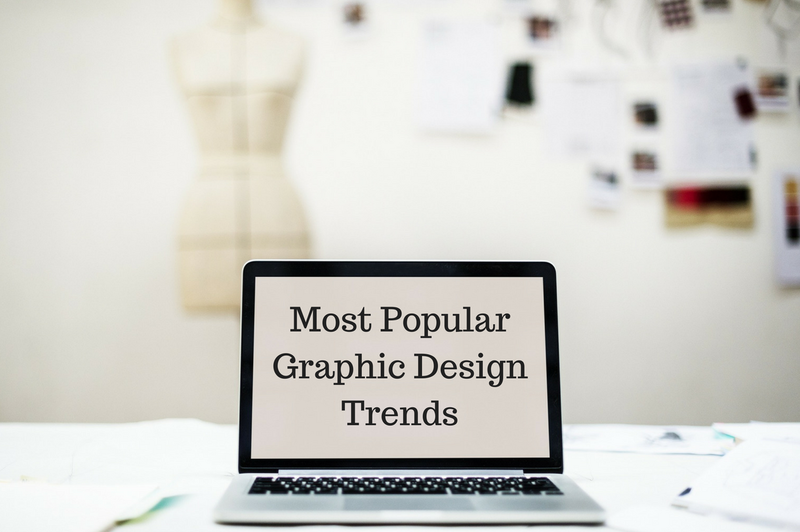 Graphic design has an important role to play in the modern business environment. The factors below will help you understand why you should start making it a priority. Graphic design helps you establish your brand in your niche market. Consumers typically associate a logo with the brand behind it. The same goes for marketing materials such as ads and product packaging. Whenever they remember your brand from a product or promotional material, you establish brand recognition. You raise brand awareness whenever consumers retain information about your brand by looking at your materials. Start-ups don’t usually have a significant marketing budget that allows them to run massive campaigns. You can, however, rely on professional graphic designers to help you get your name out there. 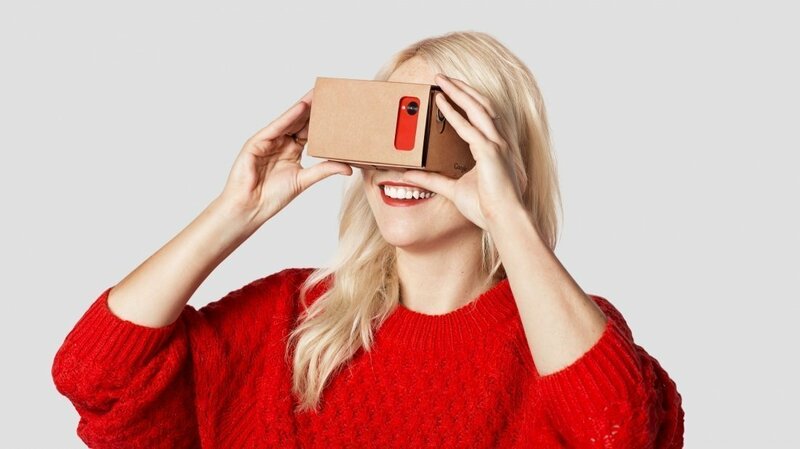 With their help, you can draw attention through your branding and promotional materials. You can make information more memorable by producing great visual content. Male characters featured in the Monopoly, Pringles and Dreamworks logos have been swapped for women by organisation Creative Equals, as a way of tackling “unconscious bias” in the media. Creative Equals initiated the project to coincide with International Women’s Day today, 8 March 2018. The organisation, which aims to promote diversity in the creative industries, wanted the visual campaign to imagine the world “through an equal lens”. It profiled a range of logos from some of the world’s leading brands, including Pringles, Monopoly and Dreamworks, and swapped their leading male figures for women. The intention was not only to shed light on unbalanced branding but to also question the diversity of the work’s creators. “Unconscious bias is such a big topic in the media at the moment, but we realised a number of logos and mascots seemed to show male figures, and no-one seems to have noticed,” Creative Equals CEO and founder Ali Hanan told Dezeen. Through subtle changes, the graphics are merged from male to female: the Pringles mascot loses his moustache, the Dreamworks child takes on a female form, and the logo for Bic pens grows two pigtails. “We looked at hundreds of loved and well-known brands across the world, and whilst there were a number of instances where women appear in logos, there were definitely a lot more males across the board,” Hanan said. Dezeen also launched an initiative to improve gender equality in architecture and design this week, to coincide with International Women’s Day. We are calling on readers everywhere to help us Move the Needle. Foster + Partners became the first major global architecture studio to commit to taking action on gender diversity, after the architecture firm – which is the 14th largest in the world and employs around 1,500 staff – revealed a gender pay gap in its staff salaries. 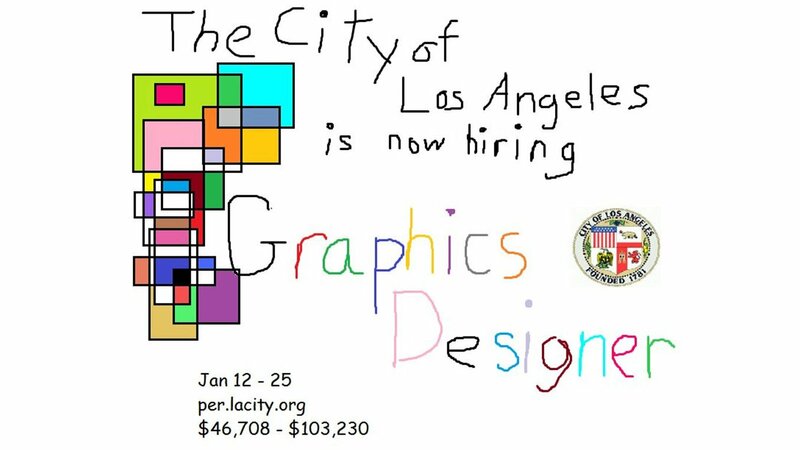 The City of Los Angeles advertised an opening for a new graphic designer role on its job-based Twitter account overnight, and it’s already received quite a response. A link to the job specs was tweeted with this tongue-in-cheek image. Using elements that will infuriate designers, or anyone with a creative thread, the image pulled the right strings. Was this created by a five-year-old? Or another fellow designer who knows how to get a response? You could argue that everything about the image is a perfectly calculated eyesore – the child-like hand lettering, use of notorious font Comic Sans (wince) and the intriguing array of multi-coloured boxes on the left-hand corner. 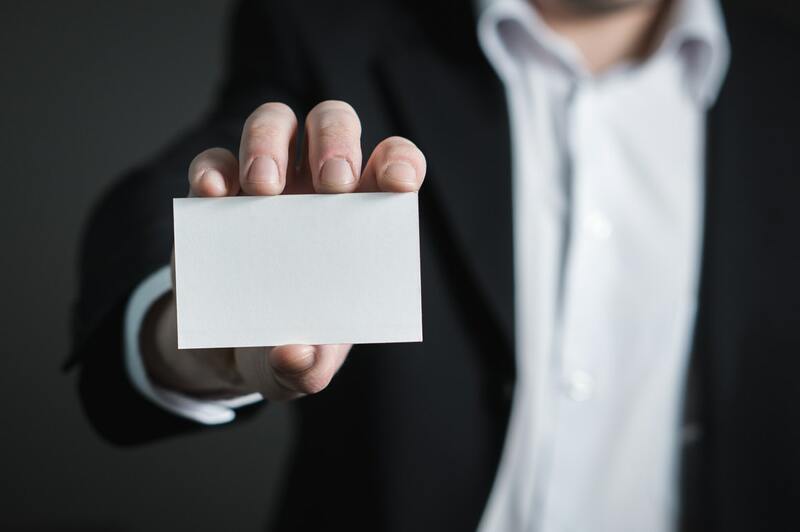 After receiving more than 9,000 likes (at the time of writing) and 4,500 retweets, it’s probably safe to say the job advertisement achieved what it wanted. Some of the comments are brutal, but even better, the City of Los Angeles Jobs account took the time to reply. It was an amusing ad until I saw the Comic Sans. Too far. One Twitter user weighed in with a ‘resume’ true to the spirit of the advertisement; an array of squiggles, a pre-school style sun and an equally infant byline to finish. Take a look at some of the other responses, including this classic Doge meme (when will those ever get old). The graphic designer role would include creating posters, pamphlets, covers, signs, exhibits and translating statistical data full-time for the City of Los Angeles across all departments, with a salary ranging from US$46,708 to $103,230 annually. Minimum requirements include a previous two years of full-time, paid experience, or a bachelor’s degree in art, graphic design or computer graphics. New Adobe Dimension CC – 3D Design Made Easy! The most problematic issues in creating 3D designs are the steep learning curve and managing 3D assets. 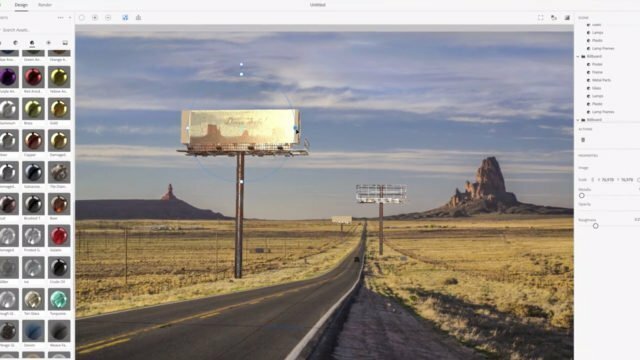 Adobe aims to tackle these difficulties by making the 3D design process much easier with its new software, Dimension CC. Adobe Dimension CC comes with free 3D assets to get projects going faster, and features a highly intuitive GUI (Graphical User Interface) compared to other 3D modelling and rendering software out there. Check the video below which demonstrates the simplicity of creating 3D in Dimension CC. Adobe Dimension CC has many essential 3D features like camera positioning, dollying tools, implementing textures, lighting options and more, all within a surprisingly easy-to-use platform. In addition, designers have the privilege to search from hundreds of free, quality 3D assets to boost their work in terms of delivery and simplicity. It seems that Dimension CC significantly simplifies 3D design, yet is powerful enough for professional use in creating photorealistic imagery, without the need and qualifications of being a 3D artist. Although designers are the main market for Dimension CC, it seems that filmmakers can benefit from the accessibility of creating 3D imagery as well, as the software works in synergy with other Adobe apps as part of the Creative Cloud. You can get Dimension as part of the Adobe Creative Cloud for US$19. 99/mo. 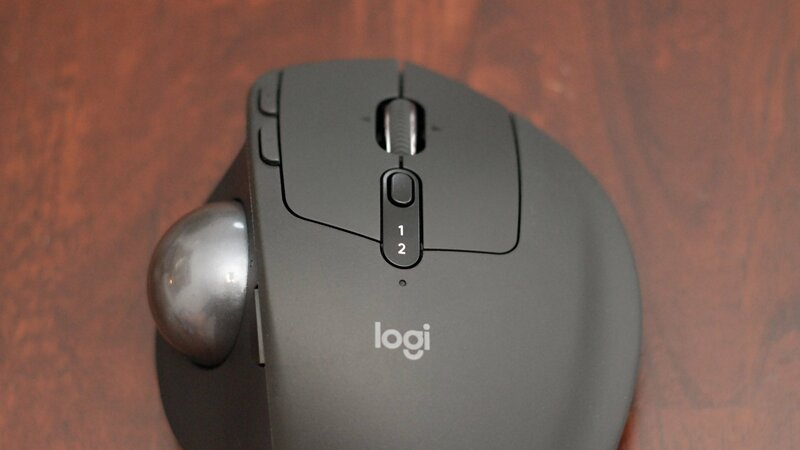 After years of no new trackball developments, Logitech has finally released a new wireless trackball mouse. We took it for an extended spin and now we’re back to highlight what’s new and awesome (and point out a minor few issues along the way). If you’re a trackball aficionado, this will all be old news to you, but for folks unfamiliar with the niche but beloved mouse market, the release of the Logitech MX Ergo is a big deal. Logitech has been producing trackball mice for decades—I’ll admit to owning, and loving, practically every model they’ve made since the early 1990s—but recently there was a bit of a stagnation in their release cycle. They haven’t released a totally new wired trackball mouse since 2002 (when they released the updated TrackMan Wheel and TrackMan Marble models) and the last wireless trackball mouse they released was the M570 in 2010. The MX Ergo, in light of that, has pretty big boots to fill both in terms of improved features and consumer expectation. With that in mind, let’s take a look at what the MX Ergo offers and if the premium $99 price tag is justified. When compared to the trackballs of yesteryear, the MX Ergo has a really nice understated design with a grey-on-grey-on-grey color scheme. The design of the body echos the general design the TrackMan Wheel and its descents have maintained—left to right below you can see the TrackMan Wheel Optical, the M570, and the MX Ergo—but it’s a bit wider looking and a little stouter from the base to the main buttons. The wider footprint definitely translates into a more comfortable grip. While my hand wasn’t necessarily uncomfortable on the older models the finger spacing (especially for the ring finger and pinky) feels much better on the MX Ergo. While we’re talking about similarities and differences between the different mice, one thing that stood out strongly is how snug the trackball is within the body of the Ergo. It’s exactly the same size as the trackball in the M570, but the tolerance between the cavity the ball sits in and the ball is much tighter. Not only does this give the Ergo a higher quality feeling but it should hopefully, over time, translate to less gunk getting in the cavity and less cleaning. Speaking of your hold on the mouse, one of the most significant new design elements in the Ergo is the inclusion of a weighted and tilt-adjustable base. You can use the Ergo in a flat 0 degree orientation or you can tilt the mouse (by firmly pressing down on the right hand side of it) up to 20 degrees for a more neutral hand and forearm position—in the image below the Ergo is tilted the full amount. Once you use the Ergo in the tilted position, we’re confident you’ll never put it flat again. There’s even a version of the mouse (only available directly from Logitech or through Best Buy) called the MX Ergo Plus that includes an additional wedge to place under the base plate for an even steeper angle. The wedge adds another 10 degrees of tilt and some people, especially those seeking relief from arthritis or repetitive stress injuries do report the extra wedge is beneficial. 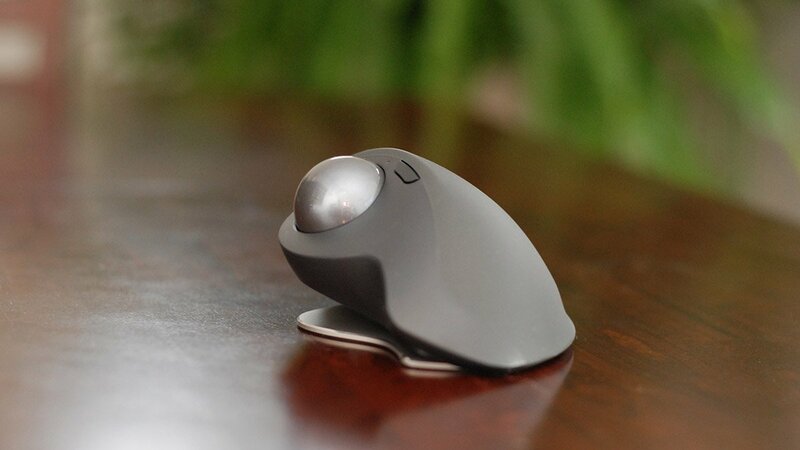 This ergonomically enhanced position is particularly well suited for a trackball mouse as, unlike traditional mice, changing the angle of the trackball doesn’t change how you use it. Vertically-oriented ergonomic mice that retain a traditional design for movement tracking require you to completely relearn how you use your mouse in a way that simply isn’t applicable to a trackball. When it’s flat you move the ball with your thumb and even if it were completely vertical you’d still move just the ball with your thumb. The trackball is just as precise as veteran trackball users would expect and even includes a small button (located directly adjacent to the trackball) that you can click to engage a high-precision mode—this mode essentially decreases the ball-to-cursor movement at a hardware level so the movement of the ball is more controlled and refined over a smaller distance. Let me tell you, as somebody who has been accused of cheating in video games because my trackball mouse is so stable and precise, the ability to press a button and crack up the precision to such a degree makes the premise of dusting off some old FPS games to do some minute-of-degree sniping pretty enticing. In addition to the standard interface elements like the left and right mouse buttons and the scroll wheel, there are three more buttons on the mouse. In the center of the mouse below the scroll wheel there is a small “Easy Switch” button that allows you to easily switch between two computers with ease. The nice thing about the switching mechanism is that it’s hardware based and using just the included equipment you can easily configure your Ergo to connect to both your desktop and laptop computers. The Ergo supports both Bluetooth and Logitech’s USB-dongle-based “Unifying Receiver” (included with the mouse) so you can plug the USB dongle into your desktop PC and then use the Bluetooth to pair the mouse with your laptop. One click is all it takes to switch between the two computers. The additional two buttons beside the right mouse button function as back and forward keys for web browsing, but can be customized via the optional control software. Speaking of software, while that hardware one-click solution we just mentioned is great when you’re tossing the Ergo in your laptop bag, you don’t even need to bother with the hardware button if you’re using the two computers at the same desk (and on the same network). Courtesy of Logitech’s Options software (available for Windows and macOS) you can both customize your mouse settings (including configuring the two small auxiliary mouse buttons on a per-application basis) and seamlessly use your mouse across two different computers (including sending folders, files, and cutting and pasting). This feature, the Logitech Flow system, is not a new introduction just for the MX Ergo, but was introduced with the general MX mouse and keyboard line. None the less, it’s the first time it has appeared on a trackball mouse and it’s pretty amazing. If you’ve spent years using work arounds for file and text transfer like emailing yourself files, copying them to flash drives, or sharing them to local network directories, you’ll find the ease of use with the Flow system to be incredibly liberating. Setup is pretty straight forward for the Flow system, but if you need additional help be sure to check out the tutorial at our sister site How-To Geek. It wouldn’t be a thorough review if we didn’t have at least a thing or two to complain about. The reality is, we really, really, like the MX Ergo and don’t have any significant complaints about it. But, as part of our mission at Review Geek, however, we strive to see things through every shopper’s eyes and, with that in mind, we do have a few items to highlight. First and foremost, the Ergo is on the heavy side. For people who stick close to their workstation, this isn’t a big issue and the extra weight gives it a nice hand feel and stability. For light packing workers on the move, though, it’s significantly heavier than the M570 (259 g versus 142 g). Do we think the extra weight is worth it? Yes. Does it pair perfectly with an ultrabook that only weighs 1,200 grams to begin with? We’d still pack it, but we’re serious trackball devotees. Speaking of weight, part of the weight is the large lithium battery inside the device. Unlike the M570, which accepted off-the-shelf AA batteries, the Ergo required occasional wired charging—the charging port is visible below. You charge the Ergo with a micro-USB cable which, while not problematic, does seem antiquated when most new premium products are using USB-C. This doesn’t bother us at all, but it does seem a little silly not to just switch to the newer standard to cut down on future cable clutter. Finally, related to power consumption, people switching from the M570 will need to get used to dealing with charging. The M570 was practically legendary for the length of time it could go without a battery swap (many people only popped a new AA battery in once a year). 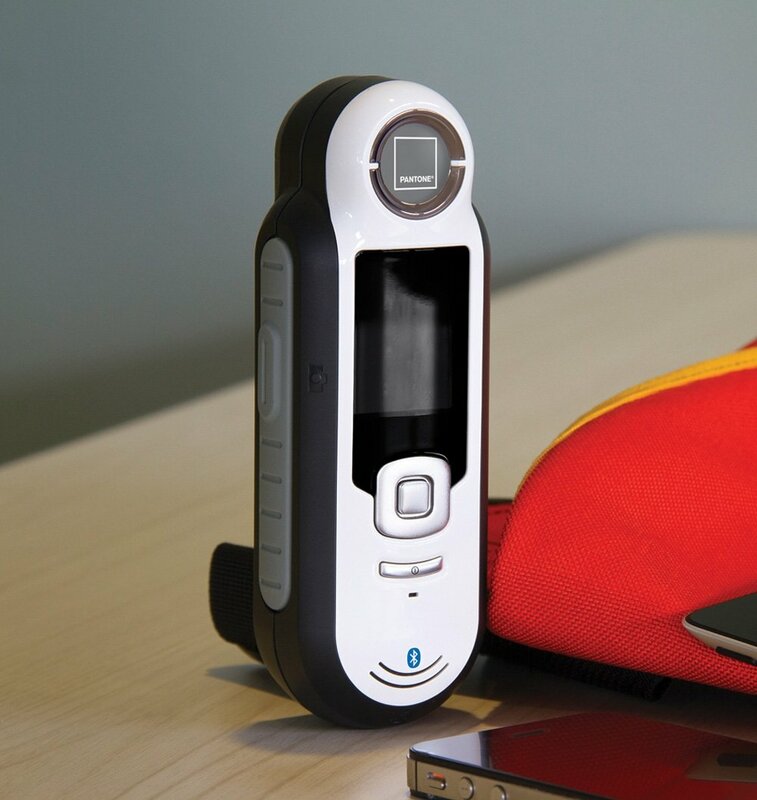 You can get months out of a charge with the Ergo if you remember to turn it off between uses. Further, Logitech claims that a single minute of charging is equal to a day of use—even if they’re off with the time estimate by 100% that’s still a really reasonable charge-to-use-ratio. Again, given the updated hardware and the demands placed on the device we don’t find the decreased battery life, compared to the M570, problematic but in the effort of absolute thoroughness we tested the battery life and took note. All told, we truly have no complaints about the mouse and are pretty thrilled Logitech has kept their line of trackball mice alive. Once you adapt to life with a good trackball mouse nothing else will ever compare—and the MX Ergo is a fantastic trackball mouse. This tutorial shows you how Select Subject, new in Photoshop CC 2018, lets you select people, animals and more with a single click, and how to refine your selections with Select and Mask! We learn how Select Subject works, and we look at examples of Photoshop’s newest selection feature in action!